Bioreduction in the Activation of Drugs covers the proceedings of the Second Biochemical Pharmacology Symposium. 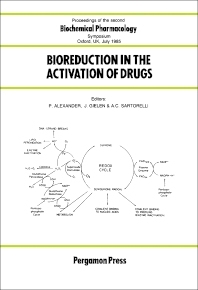 The book presents papers that cover the applications of bioreduction in drug activation, along with its concerns. The text first presents materials about enzymology, such as overview of enzyme systems involved in bioreduction of drugs and in redox cycling, and reductive role of glutathione in the redox cycling of oxidizable drugs. Next, the book covers papers on bacterial and parasites infection, which include reduction by the gut microflora of animals and human and reduction of nitroimidazoles in vitro and DNA damage. The remaining articles deal with cancer treatment, such as hypoxia-mediated nitro-heterocyclic drugs in the radio- and chemotherapy of cancer, and the biological properties of reduced nitroheterocyclics and possible underlying biochemical mechanisms. The text will be of great use to researchers and practitioners of medicine, pharmacology, and biochemistry.